Customer Stories – Inclusion Inc. Entering the brokerage in 2001, John Kelting has become a successful painter and is a hit in the world of “outsider art”. He attributes a lot of this success to the support he has received from providers who have helped him “think outside the box”. He paints what is important to him and has painted portraits of several characters and celebrities. His paintings have given him the opportunity to make contact with a couple of celebrities. Arnold Schwarzenegger received a portrait John painted and Schwarzenegger replied personally, telling John he would display the painting in his office. 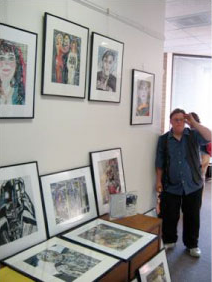 His art has been shown in several venues and collectors are now purchasing it.